Enjoy mini golf for a cause, combined with beloved children’s literature themes at the Hastings Hole-in-One weekend fundraiser for The Writers’ Exchange. 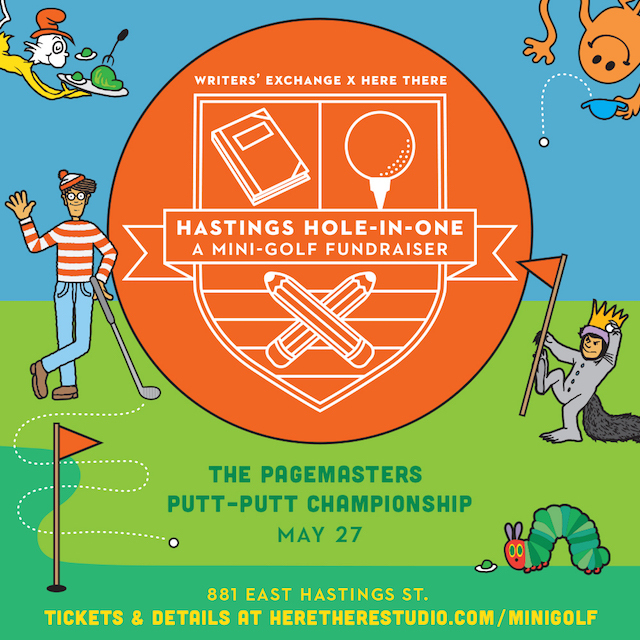 Here There is joining forces with The Writers’ Exchange to pull stories from the pages of your favourite kid’s books and put them onto the green for Hastings Hole-in-One, a wacky, storybook themed, pop-up mini-golf fundraiser. The evening events starting at 6:00pm on Friday, May 27th and Saturday, May 28th are 19+. Play holes inspired by your most cherished classics like the Paper Bag Princess, Where the Wild Things Are, Harry Potter, and the Very Hungry Caterpillar. On the evening of May 27th, rally friends and workmates for The Pagemasters Championship mini-golf tournament for a chance to win big bragging rights and the coveted Pagemasters Trophy. For those not feeling competitive, Putt-Putt For All on May 28th gives mini-golfers a chance for casual play with music, drinks and prizes – all while supporting The Writers’ Exchange. Looking for something all-ages? There will be a Families and Friends daytime drop-in on May 28th and 29th. The Writers’ Exchange is a program dedicated to getting inner-city kids excited about reading and writing. Here There is a studio dedicated to crafting experiences to activate brands, ideas and objects in pursuit of good times.